NATO ship HMCS Toronto arriving in Odesa for a routine port visit while SNMG2 is in patrol in the Black Sea. ODESA, Ukraine (April 1, 2019) – Two ships from Standing NATO Maritime Group Two (SNMG2) arrived in Odesa, Ukraine today for a routine port visit. 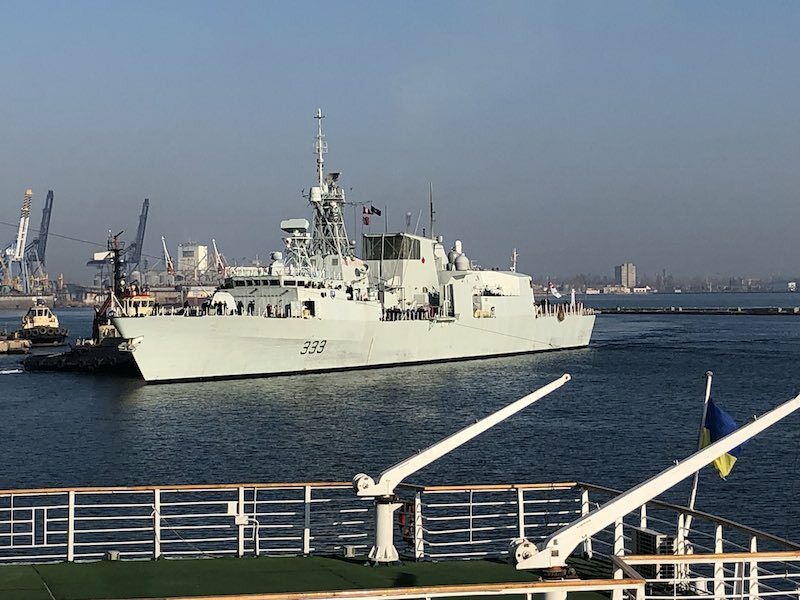 Canadian frigate HMCS Toronto and Spanish frigate ESPS Santa Maria arrived in Odesa after patrolling in the Black Sea with fellow SNMG2 ships for the last several days. While in Odesa, the ship captains will meet with local military and elected officials, work with Ukrainian Navy personnel and welcome local Ukrainian civilians aboard during scheduled open ship periods. Following the visit to Odesa, HMCS Toronto plans to conduct a Passing Exercise with Ukrainian Navy ships in the Black Sea to enhance interoperability among Allied and Partner nation ships. Three Allied nations border the Black Sea, and NATO regularly conducts exercises and operations in the Black Sea in order to maintain a credible and capable defensive readiness. This is the second patrol of a Standing NATO Group in the Black Sea in 2019, Standing NATO Mine Countermeasures Group Two (SNMCMG2) spent approximately 20 days patrolling in the Black Sea in February visiting Varna, Bulgaria and participating in mine hunting exercise Poseidon. Since Russia’s illegal and illegitimate annexation of Crimea in 2014, NATO has increased its presence in the Black Sea. Patrols by NATO Maritime Groups increased in 2018 to three patrols for each group for a total of 120 days of NATO Group presence over the year, compared to two patrols for each group and a total of 80 days in 2017. Concurrent with the port visit to Odesa, Royal Netherlands Navy frigate HNLMS Evertsen along with group members Bulgarian frigate BGS Drazki, Romanian frigate ROS Regele Ferdinand and Turkish frigate TCG Yildirim are conducting a port visit to Poti, Georgia. Georgia is another NATO Partner on the Black Sea. SNMG2 is one of four standing NATO groups which are multinational, integrated maritime forces made up of vessels from allied countries. These vessels are under continuous NATO command to perform a wide range of tasks ranging from deterrent presence and situational awareness to exercises and the conduct of operational missions. They demonstrate Alliance resolve and foster solidarity, as well as enhance the Alliance’s relations with Partner nations through visits and exchanges.